One product is all you need! 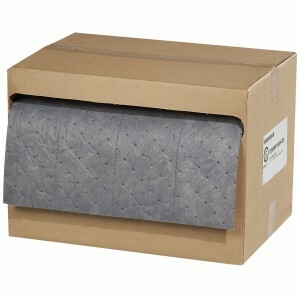 Use conveniently packaged All-in-One SurvivorSeries Mat Roll as a Roll, Pad or a Sock. Handy dispenser box keeps Mat clean and can be stored anywhere for easy access. Absorbs high volumes of liquid fast. Color-coding helps you visually identify the right sorbent for your needs. Grunge-hiding Gray signifies universal sorbency for oils, coolants, solvents and water. Roll is perfed every 3.75" vertically and every 17" horizontally for increased versatility.